As Vassar has expanded over its long history from a single, all-inclusive building to a campus of over 100 specialized structures—classroom buildings, residences, laboratory and recital spaces, libraries—it has demolished only two significant structures: Silliman and Farnsworth’s Vassar Brothers Laboratory (1880-1938) and Renwick’s entrance lodge (1865-1914). And if “adaptive reuse” is a Vassar tradition, no building has been adapted more variously than the Calisthenium and Riding Academy. The Poughkeepsie architect, John A. Wood, a native of Sullivan County, had done some revisions to Renwick’s plans for Main Building during its construction, and, although he moved his practice to New York City in 1871, he later designed the Vassar Home for Aged Men (1880) and the Vassar Brothers Institute (1882). The college’s first gymnasium reflects Matthew Vassar’s innovative conviction that exercise and “physical education” were, as a college prospectus proclaimed in 1865, essential to Vassar’s educational plan: “A sound mind in a sound body is received as a first truth among educators. In our plan of education. . . we must include Anatomy. . . Physiology. . . Hygiene, by which we are taught the laws of health and the art of preserving it.” Calisthenics, "training calculated to develop the beauty of the human figure, and to promote elegant and graceful movement," in an early definition, was just being developed by physical educators such as Dr. Dio Lewis and advocated by reformers of female education such as Catherine Beecher when Vassar and Milo P. Jewett were planning their college, and Vassar's building was the first and perhaps the only one ever designated for the inculcation, in women, of "beautiful strength." The red brick building, similar in color to the Observatory and Main, echoed them also in the Second Empire style mansard roofs capping the towers on either end and behind the façade. But the façade itself—smaller, hexagonal towers flanking a sweeping rounded arch containing at least twenty arches in three scales with dark mortar lending a polychrome effect to the elaborate brick detailing—were in the style known as Lombard Romanesque. When the building opened, in 1866, The New York Times called it the most beautiful structure of its kind in the country, noting also that is was second in size only to the gymnasium at West Point. 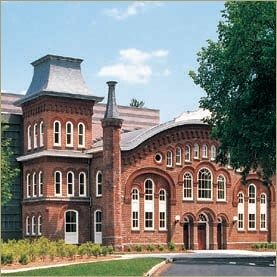 Completed by the start of Vassar’s second academic year, the building included a calisthenics hall (30 by 80 feet), a riding arena (60 by 120 by 46 feet), a bowling alley, music practice rooms, and a concert hall and stage. The calisthenics hall was outfitted with gymnastic equipment that advanced Dio Lewis's principles of “physical culture,” and the riding arena was said to be well-ventilated. The basement contained stalls for twenty-three horses, a carriage room, carpenters' and joiners' shops, rooms for other college employees, and living quarters for the German riding instructor Baron Leopold von Seideneck and his family. A hay loft in the back of the building was two stories high. However central and durable to the Vassar education “a sound mind in a sound body” has proven, the equine component faded quickly. By 1873 the riding academy was costing too much, and efforts by the Baron to supplement its clientele failed. The building underwent its first adaptation, at a cost of $27,000, and reopened in 1875 as "The Museum," with a dedicatory appearance by Louisa May Alcott. The hayloft became a series of music rooms, a skylight transformed the riding arena into much-needed new quarters for the art gallery, and scientific cabinets were moved from Main to the front of the renovated academy, creating a museum of natural history. The dramatic hall, called “Society Hall,” moved from the first floor to the second, and a science lecture room, a laboratory and room for the music professor were created on the first floor. The gymnasium, along with the basement bowling alley, remained in service. Calisthenics remained in The Calisthenium. With the opening of the Alumnae Gymnasium (now Ely Hall) in 1890, the last vestiges of the Calisthenium’s original function decamped, and the calisthenics hall became Vassar’s hall of casts. The acquisition of plaster casts of works of art, ranging from famous Greek and Roman statues to Lorenzo Ghiberti's bronze doors of the Baptistery in Florence—a recent acquisition in 1890—had begun in the college’s second year, under the direction of Vassar’s first Professor of Art, Henry Van Ingen, and continued into the early 20th century. In 1915 painting classes and the art gallery were moved from the Museum to the newly built Taylor Hall. A fire in 1918 destroyed Main's rear wing and the large space in which college assemblies were held, coincidentally transforming the Calisthenium/Museum once again. 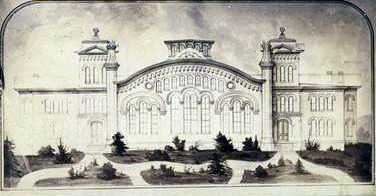 It became the new location for the assembly room and was accordingly renamed Assembly Hall, and its stage was the scene of lectures and various dramatic activities. By natural extension, the building—renamed Avery Hall in 1931 in honor of Alida C. Avery, the first resident physician and professor of hygiene and physiology—fostered the development of drama as an academic discipline. The Vassar Dramatic Workshop had been founded in 1916 by Professor of English Gertrude Buck, and in 1918 Vassar had been the first American college to offer a course in drama and to use the theater in English instruction. The Vassar Experimental Theatre, under the leadership of Hallie Flanagan, used the Avery facilities from 1925, and Division of Drama was established there in 1938. In 1932 music classes were moved from Avery to the new Belle Skinner Hall of Music, and the Classics and English departments moved to Avery from Rockefeller Hall, thus ending years of agitation by the English department for more office and conference space. Drama, Classics, and English continued to be housed in Avery Hall, and even after the opening of the Powerhouse Theater, in 1973, the original proscenium theater—through several renovations—served as the department’s main stage, while stage sets were built in what had been the hall of casts. With the conversion of Sanders Chemistry Building to Sanders Classroom in 1989, the English and Classics departments moved from Avery Hall and planning for the ultimate and most dramatic conversion of the Calisthenium and Riding Academy got underway. The building had not been planned with the structural support of its contemporaries, Main Buiding and the Observatory, and over decades both emergency and planned efforts to correct flaws from roof beams to foundation and from drains to masonry had become both more urgent and less successful. Moreover, the Avery site had been under consideration for at least 30 years for a modern drama or performing arts center. While there is still a very strong theater tradition, from Shakespeare to the present day, there is also a great deal of experimentation and new developments in film and video… In the character of what's happening in these artistic and intellectual and academic disciplines, there is this tension, which is actually life-giving and sustaining, between the old and the new. The incorporation of the Calesthenium and Riding Academy into the Center for Drama and Film is also emblematic of its place among Vassar buildings, as an almost infinitely adaptable site, for 130 years, for some of the college's most distinctive contributions to liberal education.